These pneumatic tire rollers are ideal for the compaction of stabilized soil, sandy soil, crushed stone, bituminous concrete, cement concrete and other cohesive and non-cohesive materials on road surface construction. 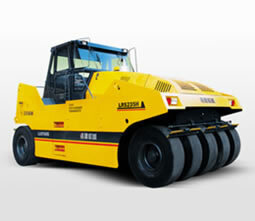 The smooth tread tire road rollers are quite suitable for the final compaction of asphalt surface course on highway. They are widely used in the construction of highway, airport, municipal road and industrial ground. 1. Our pneumatic tire rollers are equipped with B series Cummins or D6114 water cooled turbocharged diesel engine. The engine can offer strong power and reliable performance. 2. To ensure reliable performance and easy operation, LRS2030, LRS1626 and LRS1016 pneumatic tire rollers utilize speed-shift synchronous gearbox and LRS235H, LRS226H and YL16G road rollers use power-shift hydraulic transmission box. 3. The anticorrosive power sprinkler system and 800L reinforced polyethylene water tank can effectively extend the operating time. 4. The compacting equipment is provided with infrared video monitoring system for easy operation. 5. It is compact in structure, attractive in appearance and low in gravity center. 6. Furthermore, it is fitted with spacious and closed driving cab. Ventilating and air conditioning devices can be installed in the driving cab, if required. These pneumatic tire rollers can be applied to compact asphalt concrete, cement or lime stabilized soil, sand, gravel, clay mixtures and other cohesive and non-cohesive materials. They are especially suitable for the compaction of surface courses of high class highway. 1. LTP2030, LTP1016 pneumatic tire road rollers are designed with low center of gravity. This makes the operation much safer and more comfortable. 2. LTP2030 compaction equipment is equipped with Cummins 6BTA diesel engine, ensuring reliable power supply. 3. Three forward and two backward speeds, fiber-glass spraying box and multi-layer water filter ensure the stability of the machine. 4. With infinitely variable speeds, LTP2030H, LTP1016H roller compactors are easy and reliable to operate. 5. LTP1016, LTP1016H pneumatic tire rollers are equipped with Cummins 4BT diesel engine. The engine can offer strong power and adapts to various environments. 6. The front wheel with self-adjusting floating structure enables our pneumatic tire roller to perform better compaction. YTO Company is a professional pneumatic tire roller manufacturer in China. We specialize in producing road roller, wheeled tractor, pickup truck, bulldozer, mower, etc. Our products have obtained CE, E-mark and OECD certificates, so you can feel secure in using them. If you are in need of afrucultural machinery, construction machinery, please do not hesitate to contact us. Forklift TruckForklift truck is extensively applied in ports, stations, airports, freight yards, warehouses, workshops, distribution centers, and some other places.